If you are planning to install spray foam insulation in your home, you might have heard or came across open cell insulation and closed cell insulation. Both of these choices are commonly used in most building applications but their usage actually depends on various factors. Typically, open cell is not used on below grade or flotation applications because it has a tendency to absorb water which could jeopardize its thermal performance since water is a poor insulation material as compared to air. Closed cell on the other hand is best utilized in areas that have small frame sizes that require the greatest possible R- value such as roofs. This type of insulation has foam cells that are closed and packed together enabling the foam to rise and expand making it a good insulating material. 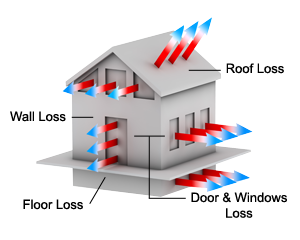 The R-value or Resistance to heat flow is around 6.0 per inch making it one of the most efficient insulating materials available in the market today not to mention it has among the highest R-values out of all traditional insulation materials. The closed cell nature of this foam insulation bars air and effectively lowers down moisture and vapor. Good water resisting qualities can also be expected. Closed cell foam has an advantage over open cell foamin terms of strength; R-value and resistance to air or water vapor break-ins. However, because this foam is denser, it requires more material which would mean more expense at your end. The density of this insulation type range from .4 to 1.2 lbs/ft3 which is lower than that of closed cell. Since the density is lower, the price would also be lower making this a good choice for people who are low on budget. Its R-value is 3.5 per inch, also lesser as compared to closed cell but can still provide excellent thermal insulation, air barrier and excellent permeability to moisture. However, since open cell foam insulation has a very controlled diffusion to moisture it should not be utilized in exterior applications or in any place where it can be in direct contact with water. It is more appropriate for residential applications because when the framing members expand and contract because of the weather condition, it will simply flex with the wood unlike closed cell insulation that gets hairline cracks as it is not flexible enough. For you to be able to decide what the best and most appropriate insulation type is for you, it is best to consult experts first for you to be sure and not waste precious resources in installing an inappropriate spray foam insulation method.